Life is full of exciting twists and turns – many of which have very little to do with our plans or intentions. My store, for example, at the moment only offers PDF crochet patterns. Before I got pregnant with Bubba, I used to sell resin and wire bobbin lace jewelry, too. But I never really desired to sell finished crochet items there. For one, I get bored easily, and making the same thing over and over would certainly take away from the joy crocheting otherwise brings me. Plus, I am a slow crocheter. And now with Bubba, I am even slower! Crochet items on Etsy are so competitively priced that I would either have to be the most expensive seller, or make peace with the fact that when it’s all said and done (or, crocheted and shipped), I made about 50 cents an hour. So it was kind of peculiar when I got contacted twice in the last week with two separate custom crochet requests. So peculiar, in fact, that I excitedly agreed. To both. One order is already with it’s new owner down in sunny Florida. I shipped it so fast I forgot to even take a real photo – all I have are these two cell phone snapshots. The second order is larger and I am still working on it. It consists of six frames – two in teal, and four in grey. I instantly fell in love with this colour combination, and can’t wait to see all of the frames together. Here’s a sneak peek – I have finished two of the frames. 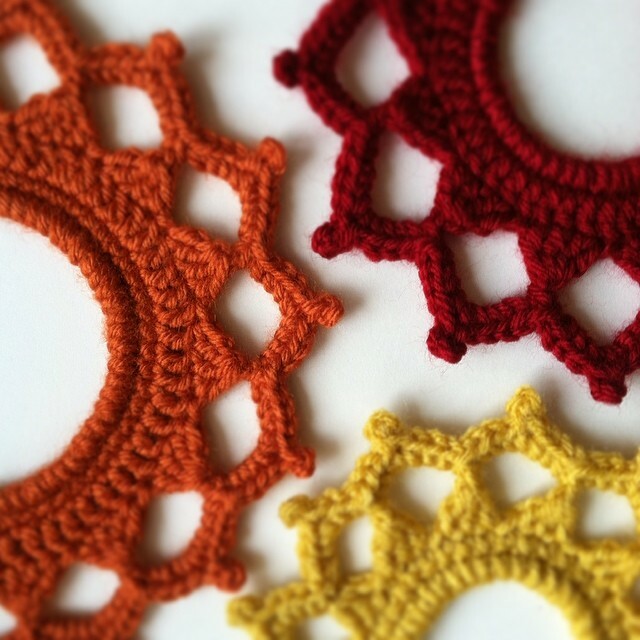 The pattern for the starburst trio is available in my shop here. The teal and grey frames can be made with this pattern here. And while you’re at my shop, look around for other picture frame patterns. There are seven in total, and I hope to have a full dozen available by this summer. These are adorable. I love the teal and grey.